7:50 PM I am looking for an index to this cemetery- can someone help? 4:47 AM HI Deb, I've been trying to get it from Jim for years! The P-town historical society has an index. They are open on Sat. a.m. 10-12. Also, Jim Casson, 815-537-5142 is the cemetery secretary and has the index. I can do look ups. Hopefully, he'll let me have a copy of it someday! I have a suggestion that might be helpful. Go to Find A Grave website and click on Cemetery Search. Then type in Riverside, select Illinois for state and Whiteside for county. Several Riverside Cemeteries will display ... select the one for Prophetstown ... it has 571 names listed there with photos of many headstones. The list may not be complete. Hope this helps. 10:38 AM Thanks Ladies- I drove the cemetery on Sunday - of course I didn't find anything! Wonder why it is so hard to obtain? 11:40 AM I think it's more of a scheduling conflict more than anything. When I'm available, he's not. I think I will just drop off a flash drive for him to upload it to. It's on my "to-do" list. He can email you with the location in cemetery. I'll work on getting it from Jim. But, if you call him and leave a msg on his answering machine on who you are looking for, he will get back with you and give you exact location. I do have a map of the cemetery that someone from P-town Historical made me. CLICK ON PHOTO TO OPEN ALBUM - scroll to last two pictures which are of the layout of the cemetery. You can print them out and tape together or just view on line. 1:05 PM Hi Denise- Thank you for the info. I did go to Geanaology trails and found the person I was looking for but no location so I did call Jim and left a nessage. Also is Janet Goodell still available for info? 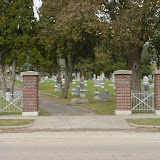 Did you see the layout of the cemetery I posted in above message? Janet is the one that made the map for me! 4:50 PM Hi Denise- she did email me this afternoon- her internet had not been working. I did see the map.